Lawn bowling is a sport with many traditions. Like curling, there are a few rules, a number of conventions, and a reliance on fair play that depends on the honour system. The number of players on a team can be from 1-4. A Skip is designated as the captain, who plays last. Playing from the mat (dark grey in the picture), the team Lead places the white target, called a Jack, by rolling it toward the Skip at the other end of the rink, or lane. 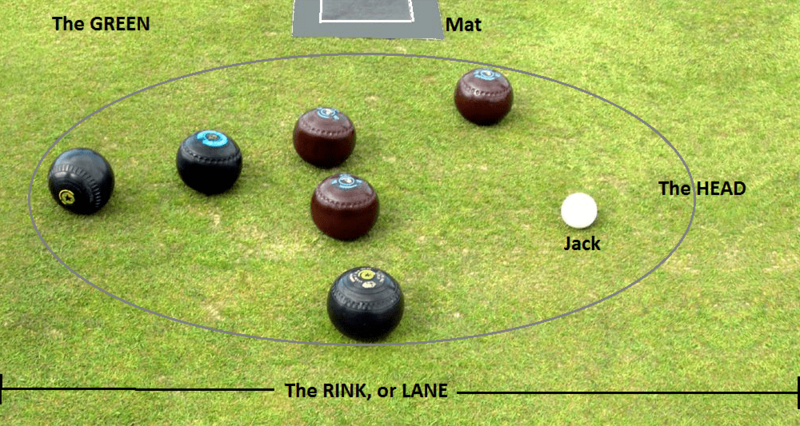 At the start, the Jack is moved by the Skip, directed by the Lead, to centre it in the lane. After that, the Jack may be moved in the lane by being hit by bowls, thereby changing the location of the target. Once the Jack is placed, that Lead rolls (not throws) the first bowl, trying to place it as closely as possible to the Jack. The next bowl is rolled by the Lead from the other team. Next, the first Lead plays their second bowl. This continues, with alternating team players rolling each of their bowls until the Skips have delivered all their bowls. That completes the End, and a score is determined. The closest bowl to the Jack is 1 point. If the same team has more of their bowls next closest to the Jack, each one counts 1 point. For instance, in the picture above, if we assume the 3 brown bowls are from the same team, the score would be 3 points for Brown. Scoring proceeds until the other team’s bowl is determined to be next. So, for an End, a team may have 1, 2, or more points. That score is placed on the scoreboard. The bowls are then raked up and a mat is placed in the centre of the lane at the, now, opposite side. The team winning the last point goes first, rolling the Jack down the lane for centring by the Skip. Play generally proceeds for 10 ends, in friendly club play. This takes about 1-1/2 to 2 hours. The number of ends can be agreed to be a different number for special occasions. Competitive play may have 16 or 20 ends. In the picture below, we see that a bowl will take a certain trajectory, rather than being able to go straight. This is because bowls are made with one side actually smaller than the other side. 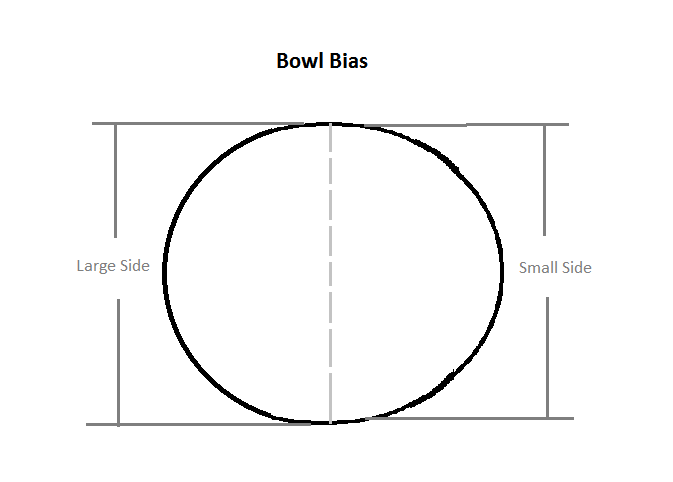 A bowl will, therefore, always turn toward the “small” side – see the lower drawing. This side is identified on each bowl by a smaller circle imprinted on that side.